글라스고, 스코틀랜드의 더 해리티지 호텔 | 호스텔월드에서 예약하세요. Enjoy affordable accommodation at the Heritage Hotel. The Heritage Hotel boasts a fast WiFi internet connection to allow guests to stay connected. 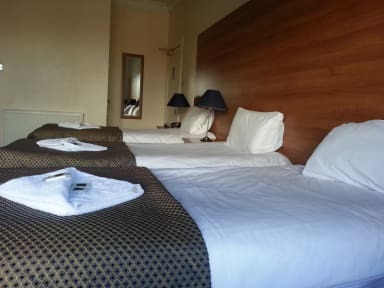 The decor throughout is simple and relaxing, so you will be assured of a comfortable stay during your time in Glasgow. Once you've enjoyed our full cooked Breakfast in our Dining Room you have a wide and varied choice of restaurants, bistros, pubs and fast food outlets within easy walking distance. The Heritage Hotel is actually 2 townhouses in Glasgow’s West End - the artistic and cultural centre of Glasgow, situated in an elevated Victorian terrace overlooking Great Western Road. Travelling around the rest of Glasgow is easy with Kelvinbridge and Hillhead underground stations within a few minutes walk. The city centre is only 5 mins on the underground or 10 mins by bus. The Heritage consists of 27 hotel rooms all with: Private en-suite, Colour television, Direct dial telephones and Complimentary tea and coffee. We have Single, Double, Triple and Quadruple rooms available. 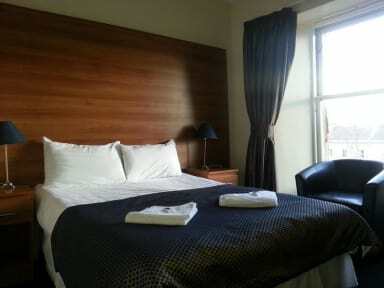 All rooms have been recently renovated to provide the highest standard of accommodation. Payment upon arrival by cash, credit cards, debit cards (Amex, Visa, Visa debit, Mastercard, Maestro, Diners club). On street parking is available at a charge of GBP 20.00 per day. There is no other nearby parking available. There are no rooms with four poster beds. It's the best choice to stay here. The staff including working in kitchen and cleaning room is very kind, needless to say front. Westend is very peaceful and sophisticated place.